Crankworx has been and gone. As usual it was filled with hot days, long nights, missed connections, cursory contacts, lift line hellos, coffee shop commiserations and bar room congratulations. In among the blurriness the problem of creating creative, original, engaging content was forefront in my mind. Crankworx is the epicenter of the world mountain bike media for ten days. Everyman and his dog is there trying to communicate the event to the world. This was my…fifth? Six? Crankworx and I’ve tried to experience it a little different each year. One year I raced everything, another year I partied everything, last year I became absorbed in the press launch pandemonium. This year I tried to take a step back from the shenanigans. The following is two of the short videos that I worked on for Bike Magazine (bikemag.com). 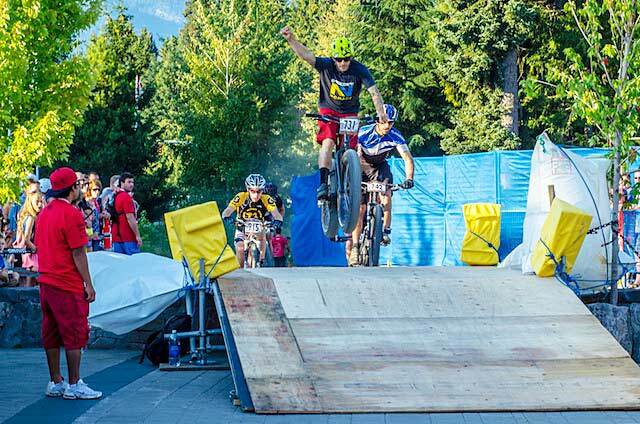 The first day of Crankworx is the Fat Tire Crit, the least interesting event to cover. It’s traditionally been the kickoff race for the whole ten-day event and in some ways marks exactly where Crankworx sees mountain biking past (or alternative) and everything that happens afterwards is their idea of mountain biking now. Bike Magazine and I used this event to have some fun, poke fun at the fat tire fundamentalists and skinny tire exercisers. It also helped start off the Crankworx coverage and showcase what readers/viewers could expect in the following days. It was accompanied by an open letter (or complaint) to Crankworx’s organizers. Photo: Joe Parkin. Rider: Seb Kemp, Crankworx Fat Tire Crit. During the week I covered other events but my favorite piece of work that week was Dan Barham and I’s look at the Red Bull Joyride Slopestyle from an angle that is utterly overlooked – the general public. It might be regarded as the world’s biggest mountain bike spectacle but to many of the people who were in Whistler this weekend the Red Bull Joyride slopestyle is just a casual sideshow. Right as the finals were going on we walked around town and asked people their experience of the event and what drew them to Whistler. Some couldn’t care less about the biking, some didn’t even know it was on, while others were simply awed by the feats of athletic daring on display. This is just an alternative angle to one of the most media saturated events in mountain biking from the perspective of the uninitiated.